Nice Job!!! That was the original thought...your "name" (or member number) as the biggest lettering. If someone has to get so close you can smell their breath through the windows, just to read your name..."that ain't good". This design gets my vote as the standard. Colors are optional. Got our stickers today. Ordered 2 and they sent three. WHAT A BARGAIN!!! 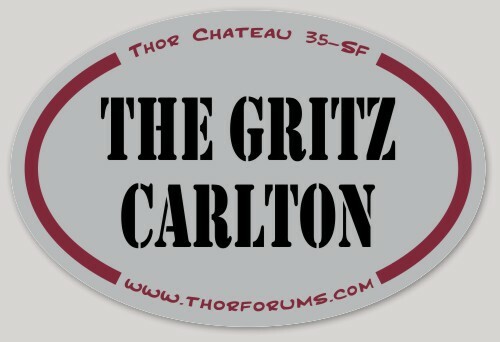 Now for placement...One on the back window; one on the dinette window (driver's side). Thoughts for the 3rd? How about the front bumper? Honestly I cannot remember my front bumper config. It's chrome, but does it have the plastic guard.? I'll look in a bit. I do like the idea that when backed in a site the sticker could be seen. I'm putting mine on the lpwer area of sofa window, dinette window and rear. I may make a "Denman" bracket for the rear and mount it on the ladder uprights. A bit skeered to stick it on painted surface. Front bumper is painted. I don't want to mess it up with bug guts and blood from people I run over on the sidewalks. If you get some really loud horns: those pesky pedestrians will stay out of your way! Got mine today also...ordered 3 and got 5...anyone need a couple? What is this? "Identity Sharing"? 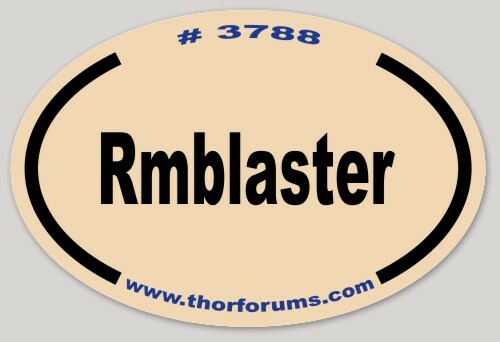 Bob...how are you gonna explain to your Tiffin peeps, a Thor Forum Sticker on your new ride?? I'll tell them that you guys know how to party! The Tiffin was a trade up: their forum wasn't. Best answer of the day!!! Now, I'll log out, go pour out this cold coffee, get a bath and take on the day!!! Hmmm...take on the evening! Good thing my calendar has 6 Saturdays and a Sunday! Go to Walmart, buy two of thier Whiskey Flasks for about $4.00 each and put em on the flasks. Or you could put em on your luggage so's you can tell which one belongs to you in an Airport if you travel by air sometimes. What is a Denman bracket?